Practical problems associated with academic reading and writing tend not to feature prominently in the language debate at Stellenbosch University. Arguably, the most pressing pedagogical issue in the current debate is the role of written language, and increasingly English, in fostering academic literacies across a range of knowledge areas, or domains, not just nationally but globally. The argument that universities need to reflect regional demographics and promote “mother tongue instruction” rides roughshod over this issue. By LLOYD HILL and STEVEN ROBINS. Dr Lloyd Hill and Dr Steven Robins are lecturers in the Department of Sociology and Social Anthropology at Stellenbosch University. Language is a very sensitive issue at Stellenbosch. While acknowledging this, we aim to unpack the current debate by way of an analysis that focuses on the ideological, policy-related and experiential aspects of language as a medium of teaching and learning at Stellenbosch. We begin by emphasizing the tension between the formal articulation of language policies (at different levels) and actual everyday pedagogical practices in the classroom. We, along with more than 200 other staff members at Stellenbosch, have openly supported the Rector’s statement, based largely on our first-hand experiences as lecturers at the university. The views expressed here are our own, but we draw on and situate our experiences within a specific academic department, Sociology and Social Anthropology, and the Faculty of Arts and Social Sciences. The taaldebat, or language debate, has been simmering at Stellenbosch for years, but the key events of 2015 – the launching of the Open Stellenbosch movement, the Luister video, the appearance of the RMT before Parliament’s Portfolio Committee on Higher Education and Training, and the #FeesMustFall campaign – have brought this matter to a head. Next week the University Council will have to choose between an “inclusivity imperative” (in Wim de Villiers’ words) and what many see as the imperative to “safeguard” the academic status of Afrikaans at the University. We write in support of the former, but in order to make this case it is necessary to trace the recent history of the language debate at Stellenbosch. The focus of the current debate is a policy adopted by the University’s Council in December 2014. Where previously Afrikaans was the “default” language of instruction, the current policy gives English and Afrikaans equal status as “languages of undergraduate teaching” at Stellenbosch. The motivation for this change came a year earlier. In April 2013, in what he termed “the most historic Council meeting of my term as Rector”, then Rector, Russel Botman, announced the core components of the University’s Vision 2030. These included a new residence placement policy and an enrolment target of 50% coloured, African and Indian students by 2018. While Professor Botman argued that the University needed to “continue to support Afrikaans”, he also identified “language accessibility” as a key objective and the increased use of English as a means of achieving this. It was, however, only after Russel Botman’s untimely passing – in June 2014 – that the process of reformulating the University’s language policy was announced. The defining feature of this policy-revision was the haste with which it was pursued. Documents outlining the new approach, policy and plan were circulated on 30 July 2014 and interested parties were given less than two weeks to submit comments. The intention, it seemed, was to “fix” a policy position prior to the appointment of a new vice chancellor. The broad intent was purportedly to align the University’s language policy with the transformation commitments that Professor Botman had made a year earlier. But the University’s Council inserted a commitment to “safeguarding” the development of Afrikaans as an academic language – a formulation that in 2015 has been challenged by both Open Stellenbosch and the Students Representative Council. The current language policy is framed in terms five options with respect to medium of instruction: Afrikaans only (A); English only (E); dual medium or use of both languages in the same class (T); parallel medium (P); and, the most recent addition, English or Afrikaans used in conjunction with simultaneous interpreting. Where until recently Afrikaans and dual medium instruction (T-option) were considered to be the “preferred options”, the current policy prioritizes “parallel” instruction, either in the form of duplicated lectures or by means of simultaneous interpretation during lectures. The official position, until recently, has been that these options offer a means to balance demands for the retention of Afrikaans as a medium of instruction with demands for transformation and greater access. The Rector’s statements on 12 November, and in an email on 18 November, would seem to reflect a commitment to change the current policy. While conceding that the policy will remain unchanged in 2016, he draws a distinction between “changes to the language policy” and “language implementation.” The following flows from this position: a tacit recognition within the RMT of problems with the current language policy and plan; an overt commitment to reviewing the current policy; and a suggestion that “implementation measures” needed to address the “inclusivity imperative” can be introduced in 2016. But what are the problems with the current policy of maintaining the relatively equal status of English and Afrikaans as undergraduate media of instruction? While not explicitly stated in the language policy or plan, the December 2014 documents reflected an important shift. In both the written policy and the official discourse on language, the reformulated commitment to “multilingualism” reflects a tacit recognition that – given the University’s commitment to changing the demographic profile of the undergraduate student population – both the Afrikaans (A) and dual medium instruction (T- option) are politically untenable. The reason for this is that both assume a minimum level of proficiency in Afrikaans as a second language – and this presumption is exclusionary. At issue is not simply “Afrikaans” as a spoken language, but rather the requirement of a high level competence in both English and Afrikaans as academic practices. In 2015 the new “preferred options” – parallel medium instruction and simultaneous interpreting – have also been contested. In the current policy a diffuse commitment to “multilingualism” tends to paper over issues associated with resource constraints (human and material) and the pedagogical demands that will become increasingly apparent as the demographic profiles of the student and lecturing staff populations change. Parallel medium instruction may be a medium term solution in some Faculties, but it is economically and sociologically unsustainable. Sociologically it assumes the maintenance of bilingual proficiency among staff. In our department Afrikaans competence has for some years not been a serious consideration for staff appointments, and we suspect this is indicative of a wider trend. The direction of translation (Afrikaans-to-English or English-to-Afrikaaans) is an important aspect affecting the politicisation of this issue: translation into English is contested, but translation into Afrikaans is much less of an issue. One of us (Hill) recently opted to lecture in English and make use of the interpreting service. The headsets were offered to a class of about 300, but there were no takers. When asked why they did not make use of this facility, the most common response was because the reading material was in English. There are however two other possible and potentially overlapping reasons for this pattern. Firstly, all or most of the Afrikaans speakers considered themselves sufficiently competent in English. Secondly, Afrikaans speakers – who might have been inclined to make use of the service – may have feared stigma in a context where English-Afrikaans bilingual competence is highly prized. For both white and black students therefore, we need to explore the extent to which wearing a headset marks one as a weaker student. Furthermore, some members of our Department have been lecturing in English for many years and seldom, if ever, encounter language complaints from their Afrikaans-speaking students. These students are, however, given the option of writing essays and exams in Afrikaans, but a growing number of first language Afrikaans-speakers are opting to write in English. Practical problems associated with academic reading and writing do not tend to feature prominently in the taaldebat. Arguably the most pressing pedagogical issue in the current debate is the role of written language (and increasingly English) in fostering academic literacies across a range of knowledge “areas” or domains, not just nationally but globally. The argument that universities need to reflect regional demographics and promote “mother tongue instruction” rides roughshod over this issue. The mother tongue lobby tends to ignore the fact that campus populations are increasingly diverse, not simply in terms of “home language” but also in terms of the complex intersection of language “repertoires” and other social markers – such as race, gender and class. Resource constraints will increasingly bring the current policy focus on the parallel transmission of “content” into conflict with the growing demand for top quality domain-specific training in academic reading, writing and other research-related skills. The status of Afrikaans at Stellenbosch has shifted: from “official” to “default” medium in 2002; and to a position of formal equality with English in 2014. And 2016 seems set to usher in another round of change, which will in all likelihood establish English as principal academic medium. This is understandably disconcerting for many people, but it is not – as Hermann Giliomee (Die Burger, 17 November) would have us believe – simply the product of bad “choices.” Decisions matter, which is why the choice facing the University’s Council on Monday will be momentous. But choices are shaped and constrained by the abilities of leaders to recognise complex aspects of a changing context. There are emerging class issues associated with the growing status of English in South Africa, but it is simplistic to describe the use of English as post-dated “colonialism.” More so at Stellenbosch, where black students – still a relatively small minority – are increasingly prominent in the transformation debate. The ideological debate is however, not simply shifting in response to “big ideas”, but increasingly as a response to what we would call “ethnographic realities” in the classroom. 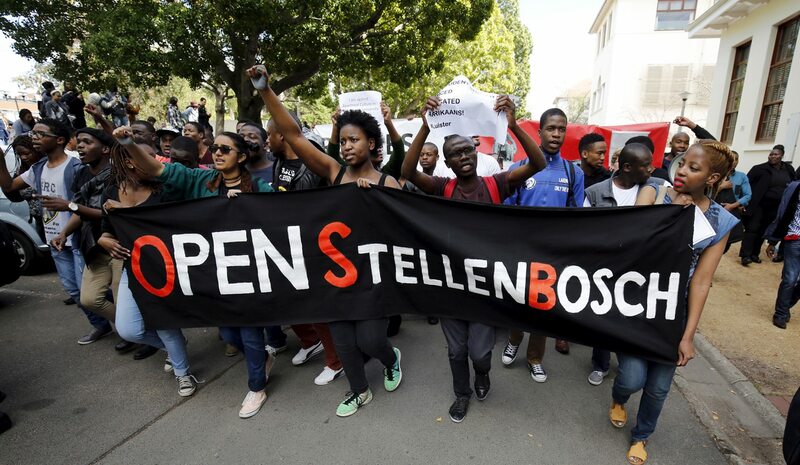 Photo: Students march with a banner during a protest at South Africa’s Stellenbosch University in Stellenbosch, in this picture taken September 1, 2015. REUTERS/Mike Hutchings.